WASHINGTON (April 28) -- A strong economy has Social Security and Medicare in better shape today than they were a year ago, according to the programs' trustees. The improved economy delays the projected insolvency of the Social Security trust funds by three years, to 2032, and Medicare will not run out of money until 2008, seven years longer than last year's projection. "Today's report is encouraging," President Bill Clinton said during a White House ceremony Tuesday. But the president warned there are still serious dangers down the road when he and his 77 million fellow baby boomers come of retirement age. "I will resist any proposals that would squander the budget surplus, whether on new spending programs or new tax cuts, until Social Security is strengthened for the long term," Clinton said. "Once more, I will insist that we save Social Security first." Once politically untouchable, Social Security reforms are now on the table. The good economic news "offers us an opportunity and an obligation to act boldly to strengthen our nation for the new century," Clinton said. Increase the retirement age beyond 65, perhaps to 67 or even older. Reduce the annual cost-of-living adjustment. Increase Social Security withholding taxes. Perhaps the most contentious reform option involves privatizing some parts of Social Security, allowing individuals to invest some of their funds in the stock market, for example. 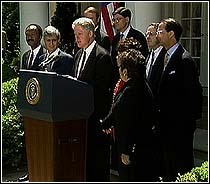 Clinton has proposed 1998 be a year of dialogue and legislation next year, after the congressional elections. "If we make this year a year of education on Social Security, I'm confident we will come together to take the necessary steps next year," he said. The top tax legislation writer for the House said Tuesday the amended projections for the program's future insolvency remain "an early warning sign" that something must be done to ensure the future of both Medicare and Social Security. House Ways and Means Committee Chairman Bill Archer (R-Texas) called for the creation of a bipartisan commission to save Social Security. "The structures of both programs are unsustainable," Archer said. "Today's report is an early warning sign. It's a message the politicians must heed. The time has come for the politicians in Washington to put the needs of our nation first and resist the urge to engage in partisan politics." Archer's proposal for a bipartisan commission to save Social Security will be debated on the House floor Wednesday. He has support from the American Association for Retired People and the Concord Coalition. Solving the Social Security insolvency problem has been embraced by both parties. In his State of the Union address, Clinton asked lawmakers not to touch any projected budget surplus until the funds become solvent.